There were no shortages of Black Friday deals on Smart Home products and you can still grab quite a few on most #MadeByGoogle products. If you’ve been kicking around the idea of getting your feet wet with connected devices, Target has a really good deal some very handy devices. Regularly priced at $49, the Google Home Mini is a great little speaker to have in more discreet areas of the home or office. On Black Friday, many retailers were offering the Assistant-enabled helper for as little as $25 which makes it a solid recommendation for any Smart Home. Target is now giving you $30 off the Home Mini when you pair it with the Wemo Mini Smart Plug. The Wemo Smart Plug works with the Google Assistant via the Google Home App and can be used to power devices on and off and if you’re really ambitious, you can set up groups as we have around the office. With groups, you can use your Google Home Mini (or other Assistant devices) to turn on groups of plugs all at one time. You can save even more if you purchase two Home Minis and two Wemo plugs. Simply add two of each to your shopping cart and the $98 discount will be applied automatically. If you luck out as I did, they may even have them in stock at your local store and you can swing in and pick them up on your lunch break. 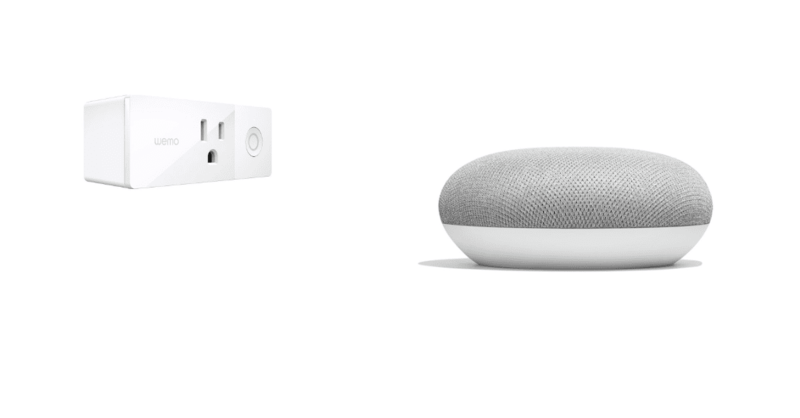 This is a very inexpensive way to get started in connecting your smart home and the Google Home Mini is perfect for fitting into rooms of any size or decor. You can pick your choice of Chalk, Charcoal or Coral and mix and match if you like. Any way you slice it, you’ll get two smart speakers and two smart plugs for under $65 and that’s a great deal.